Is there a better alternative to MoboMath? Is MoboMath really the best app in Mathematics category? Will MoboMath work good on macOS 10.13.4? 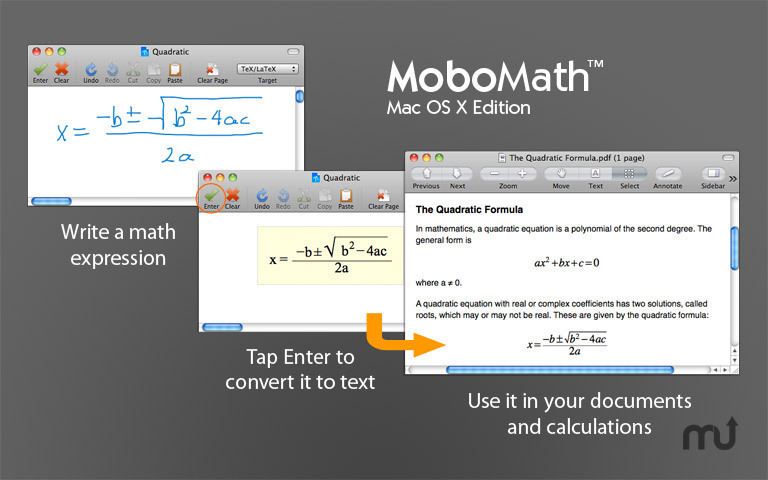 MoboMath lets you create formatted math expressions for your favorite applications in your own handwriting. Using a pen and tablet, or even a trackpad or mouse, simply write an equation as you normally would, tap 'Enter' to convert it to formatted math, and copy or drag it into your target application for calculation, graphing, or documentation. New tools to adapt MoboMath to your individual handwriting style. If you write a character in your own special way, you can now train MoboMath to recognize it. Support for the most recent OS X releases including Mountain Lion. MoboMath needs a rating. Be the first to rate this app and get the discussion started!